Andrea Moon (b. 1980) grew up in Northwest Ohio and began making in clay at a production pottery company, Packer Creek Pottery. She attended college at Bowling Green State University, Bowling Green, Ohio receiving her BFA in 3-Dimensional Studies. 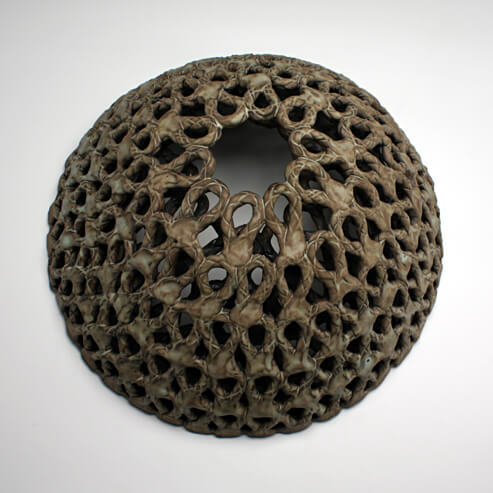 In 2009 Andrea completed her MFA in Ceramics and a secondary in Sculpture at Texas Tech University, Lubbock, Texas. Among teaching classes at various institutions, participating in national workshops and exhibitions, Andrea has completed a year long Artist-In-Residence at the Arrowmont School of Art and Craft, Gatlinburg, Tennessee 2011 and the Red Lodge Clay Center, Red Lodge, Montana 2012. Presently, Andrea has joined the Red Lodge Clay Center staff as the Residency and Communications Coordinator and will reside in Red Lodge, Montana. I make sculptures that confront personal transitions, reminisce vulnerable layers, and challenge structure. Constantly striving to maintain a balance in change and patience among apprehension, I use the figure as a vessel to visually state control contradicted by precariousness. Slight bends or subtle gestures act as small ways to express a timid strength. I create these structures embodying negative space to question emptiness and fulfillment simultaneouslyï¿½ a fulfillment of balance and order, but also an emptiness of ironic volume. Building sculptures with multiple clay parts to create volume, form, and balance I layer basic foundation principles of repetitive textures. I use the raw surface of clay obsessively to preserve stability and attention to the importance of structure in my life. As I create everyday, thoughts constantly pursue me on regulation of self, structure among weakness, and thickness between layers. My process of making has become a set of conceptual principles that mirror basic techniques of building with clay.